The third installment of the reboot Planet of the Apes movie series now has a teaser to go with its name. 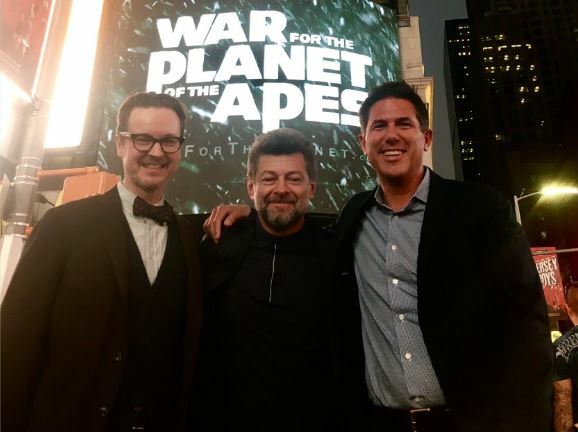 The wordy-but-consistent with the franchise title War for the Planet of the Apes was featured at New York Comic Con today, with star Andy Serkis, director Matt Reeves, and producer Dylan Clark revealing the teaser plus a scene showcasing Serkis’s lead character Caesar taking on a new nemesis. Woody Harrelson plays an aggressive ape leader referred to as Colonel. The film pits the Colonel against lead protagonist ape Caesar, with plenty of sparring over the course of the film. In the brief clip shown to Con attendees, Caesar and orangutan Maurice (Karin Konoval) lead a group of armed apes to raid a village of humans. The story continues two years after the events in 2014’s Dawn of the Planet of the Apes, also directed by Reeves, the sequel to the first of the reboot series, 2011’s Rise of the Planet of the Apes (Dylan Clark was a producer on that film, too). War for the Planet of the Apes also stars Judy Greer (Ant-Man, Tomorrowland, Jurassic World), Chad Rook (Timeless, Supernatural), Ty Olsson (Continuum, Supernatural, Battlestar Galactica) and Steve Zahn (That Thing You Do!, Sahara). War for the Planet of the Apes is in production, with WETA working on post-production effects and editing now. Look for it in theaters July 14, 2017.